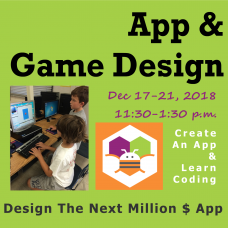 Workshops: 9:00 - 11:00am, 11:30am - 1:00pm and 1:30 - 3:30 p.m.
We look forward to seeing you this winter; register early to secure a spot. Refund Policy. Our regularly scheduled Classes from 4:00pm-6:15pm will not be held during winter break. Personal Coaching: Individual coaching & computer skills development is available. Topics: Coding, Python, C++, Java & more. $45 per hour (min. purchase of 4 hours); add a 2nd student to the class for $25. Coaching for adults is available. Call 818.206.2628 to register. 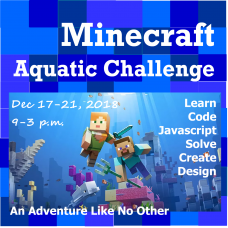 Join us as we take the plunge and explore a new world that is the Minecraft ocean. There are lots of.. 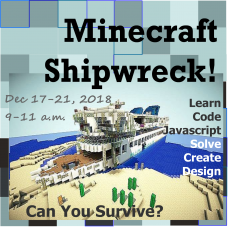 This one-week summer camp aims to inspire your child to look at Minecraft differently. You’ve crash ..
MIT’s App Inventor is the easiest way to learn how to make an Android app &/or iOS app. 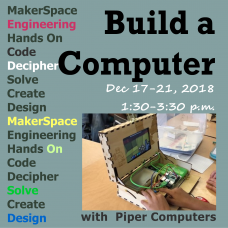 In this ..
We are going to learn how to build a computer with the Piper Computer kit. The students will follow ..